Jazz music, speakeasies, flappers, and the mob were all part of Kansas City in the 1920s, but the Paris of the Plains was also swarming with creativity and innovation. In the early twenties, Walt Disney started an animation company called Laugh-O-gram Films on E. 31st Street in Kansas City where he created black and white animated short films based on classic fairytales. He befriended a small mouse in the building, which was said to have inspired his creation of Mickey Mouse. Later that decade, Ernest Hemingway, who had previously worked for The Kansas City Star, drove his wife back to the city for the birth of their second child while, at the same time, he was putting the finishing touches on one of his greatest masterpieces, A Farewell to Arms. And just around the corner, dressmaker Nell Donnelly Reed was making her mark in history. Nell, born in 1889, grew up in the humble town of Parsons, Kansas and developed an interest in sewing at a young age. After moving to Kansas City and marrying Paul Donnelly, she quickly grew tired of cooking, cleaning, and handling other day-to-day domestic minutiae in the unflattering, drab clothing available to middle-class housewives. She asked herself, "Why not put a frill on it, the way I do on my holiday aprons?" 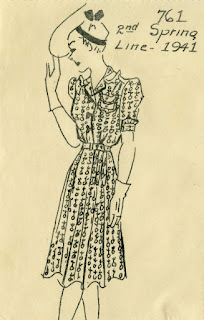 As a result, Nell quickly reinvented the house dress in a way that would have made June Cleaver swoon. Her friends and family were so smitten by her dresses that they encouraged her to start a business. 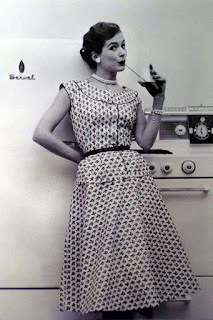 Nell told The New York Times, "I'll make women look pretty when they are washing dishes." And she did just that. In 1916, Peck's Dry Goods in Kansas City ordered 18 dozen of Nell's dresses with the hopes of selling them for $1 (compared to the average price of 69 cents). Nell rushed out and purchased a few sewing machines and hired two girls to help her construct the 18 dozen dresses in her home. An article published in The New York Times about Nell's beginnings wrote, "Nell inquired at the store at noon of the day of delivery. Not one was left on the racks. From then on she contracted to deliver two dozen a day. It was not long before the other stores in the city became aware of the new style in house dresses. They sought out the young designer." In a building not far from Walt Disney's studio in the early twenties, Nell employed 250 employees. 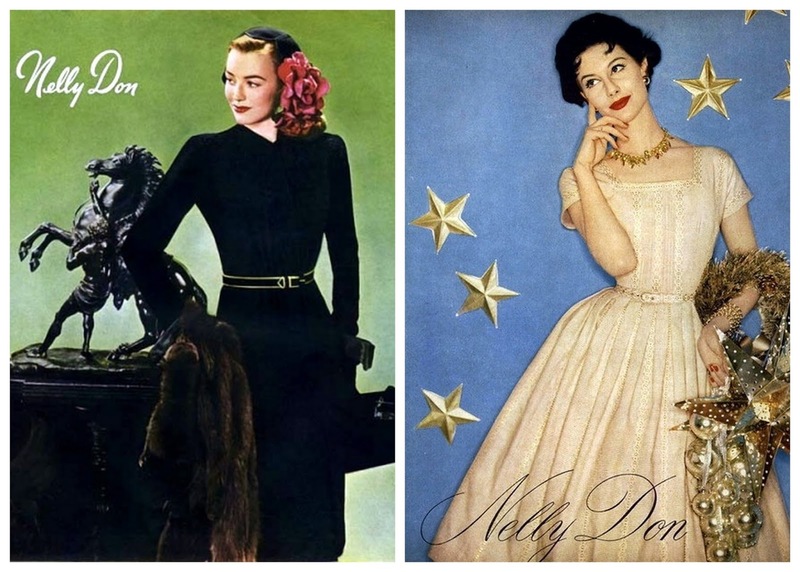 Mirroring Henry Ford's approach, she brought the assembly line to garment production and came up with catchy tag lines for ads including "Nelly Don, Just Try One On" and "'Tis inward satisfaction to don a Nelly Don". Ironically, Nell's achievements proved that women could be successful outside the home, but she still embraced her initial passion of making quality and stylish dresses for housewives of all sizes at an affordable price. By the early 1930s, Donnelly Garment Company housed over 1,000 employees and was up to $3.5 million in sales. Aside from her booming success, Nell made headlines across the country when she and her chauffeur were kidnapped in 1931. Their abductors forced Nell to write letters to her husband and a lawyer demanding $75,000 for her release. James Reed, a former U.S. Senator from Missouri, neighbor of the Donnellys, and father of Nell's newborn son (that's a whole other story) was contacted about the kidnapping and sprung into action. Reed went straight to Johnny Lazia, the reigning mob boss of Kansas City's organized crime scene, and threatened that if Lazia didn't find Nell within 24 hours, he would buy 30 minutes of radio time and reveal his shenanigans and shady connection to Tom Pendergast. Lazia acted quickly and sent 25 carloads of armed gangsters out into the city in search of Nell. Needless to say, members of Kansas City's mafia soon found Nell and her chauffeur unharmed in a four-room cottage in Bonner Springs, KS. Nell later said that the men who rescued her were scarier looking than her kidnappers. Nell acquired a New York office in the Empire State Building as Nelly Don dresses were flying off the racks of high-end stores such as Bloomingdale's. Fortune Magazine described her as possibly the most successful businesswoman in the United States. 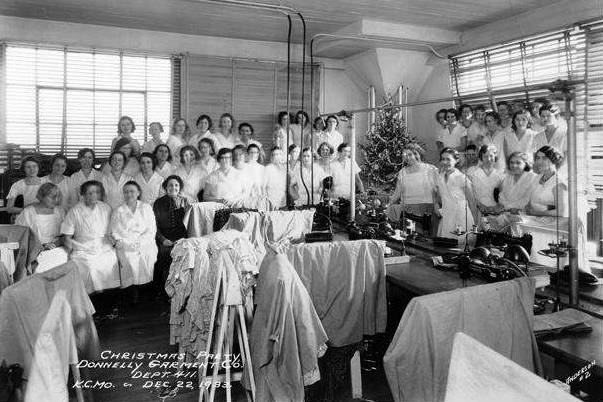 She kept her self-made business thriving through the great depression and wartime (Donnelly Garment Company was the largest manufacturer of women's military and work clothing during World War II), while still managing to be among the first in Kansas City to offer paid group hospitalization for employees and tuition benefits. She also strived to make her workers happy with perks such as a cafeteria, a cart that offered lemonade and snacks in the afternoon, company parties, and an in-house shop where employees could acquire unused fabric to make their own clothes at home. 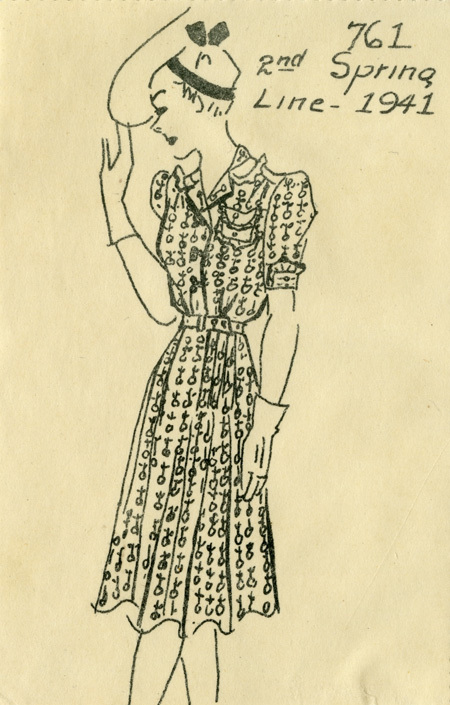 Nell designed and sold more dresses in the 20th century than any other single person in the United States. Just like Nell Donnelly Reed, Marc Jacobs shares the concept of feeling "decadent" at home by wearing exquisite clothing. The drab, Mother Hubbard clothing worn by housewives in the early 1900s may be comparable to the styleless, matching sweat suits and yoga pants worn by modern day homemakers. Inspired by Nell, I recently designed and sewed my own house dress (highly unlikely I'll be doing housework while wearing it). I chose a unique black fabric with appliquéd flowers and added fullness to the skirt, which gives it a 1950s vibe. 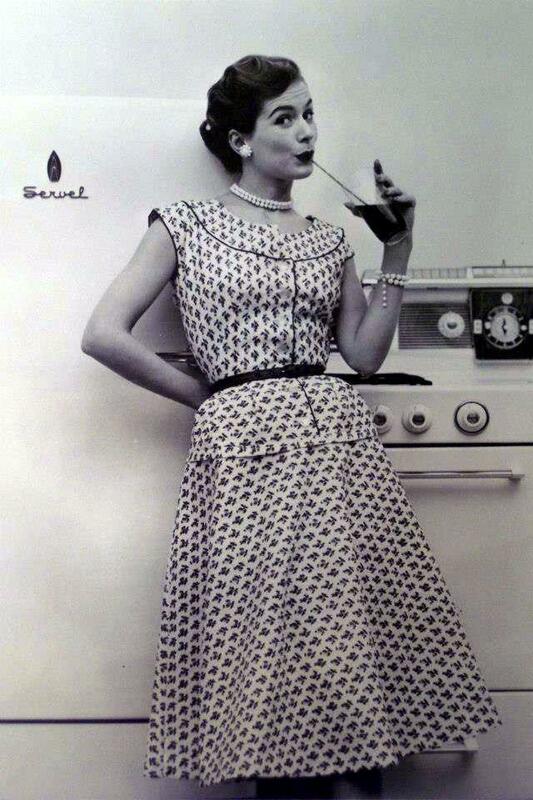 As Nell once said, "No housewife in America today need look dowdy and frumpy, unless she wants to be that way."